As one of the most talented and versatile men ever to play for Staleys, Ken Huffine’s professional football career had a most inauspicious start. After graduating from Purdue University in 1920 he became the player-coach of the Muncie [Indiana] Flyers, perhaps the worst and most short-lived of all of the original APFA teams. In their only ever league game the Flyers played Rock Island [Illinois] at Douglas Park on December 4, 1920, one of two official APFA games that day. Muncie’s line, with very few college players, leaked like a sieve and three out of four of Huffine’s first quarter punts were blocked with each resulting in an Independents’ touchdown. Thus Huffine is credited with having the first punt blocked and most likely the first team scored upon in sanctioned American professional football. This game also featured the play of Rock Island’s Bobby Marshall, the first African-American, and surely at age 40 the oldest man to appear in an APFA game in 1920, as the Quad City team rolled to a 45-0 victory. The Staleys immediately cancelled their upcoming game against Muncie and the Flyers franchise folded. Huffine grew up in the small central Indiana town of Kirklin where his father operated a general store. He was on the football team when the town still had its own high school. He entered Purdue in the fall of 1915 and played football on the “freshman varsity,” joined the Phi Kappa Psi social fraternity and majored in mechanical engineering. He lettered in football in 1916 and 1917 and according to the school newspaper “won for himself the name of being a veritable human battering ram.” Even though on a poor team he was officially selected as second team all-conference but was named the best fullback in the conference by the Daily Illini sports editor who wrote, “Huffine is a quick starter, charges like a shot out of a cannon, travels low, picks his holes, can gain through almost any kind of a line and is a great defensive player.” The writer also picked future Staley backs Dutch Sternaman of the Illini and Bob Koehler of Northwestern for the first team. Although elected the 1918 team captain, instead of college Huffine became an army private and did not get back to Purdue until the spring of 1919. He was again elected football captain and lettered that season playing fullback, kicking off and punting. He was also a very good student, member of the Glee Club, an excellent pianist of many styles as well as senior class president. Promoting his March 1920 concert performance the school paper reported “in piano duets. Huffine’s exceptional reach, one note less than one and one-half octaves, makes it possible to attain tonal effects, impossible for the ordinary player. In the concerts which have been given, Huffine’s enviable record as a football player, was sufficient to attract much attention, but on hearing him play people wondered that two talents, so much the antithesis of one another could be found combined in one person. Still further, his scholarship won him Tau Beta Pi” [the national honorary engineering fraternity]. 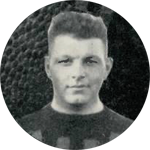 After his short 1920 stint with the Muncie Flyers Huffine was the starting fullback for the Staleys in all but one of their games in 1921 with former Purdue freshman George Boland as his backup for the league champions. Having married Alice Wilson before the season on May 4, 1921, Huffine decided to pursue his engineering career in Muncie, Indiana instead of continuing with the Bears in Chicago. His son Kenneth Jr. was born and died in 1922 and son James was born in 1923. While Huffine played professional football on Sundays for the Dayton Triangles [1922-1925] he worked in Indiana for Interstate Steel, Webster Engineering, and Durant Motors [GM]. By 1930 he was the general manager of the Banner Rocks Products Company in Alexandria City, Indiana, maker of rock wool insulation. He then began working for Johns-Manville as the manager of their Alexandria plant before becoming the general manager of their asbestos mill in Waukegan, Illinois with 2700 employees. [Unfortunately later an environmental hazard along Lake Michigan and one of the EPA’s first super fund clean-up sites.] In 1945 he was made director of engineering for Johns-Manville in New York and later became vice president and senior officer of the company. The man who scored five NFL touchdowns was also a very accomplished golfer. While living in Bronxville, NY, he returned to Illinois several times during the summer in the early 1950s to play in the Western Senior golf tournaments. He also returned to many of the Bears’ alumni club parties in December but appears not to have made it to the large Staley anniversary reunion in October 1956. On June 3 of that year Ken Huffine was awarded an honorary doctor’s degree in engineering during the school of engineering graduation ceremonies in Lafayette. He later retired to Naples and then Sun City, Florida where he died at age 79 years old. He was buried in Ruskin Memorial Park in Ruskin, Florida and was listed as a member of “the original Chicago Bears” in all of his obituaries.